We make our choices, "Come what may." What if I had turned right instead of left? Does my life-story have a happy ending? In life, we face a multitude of crossroads and choices. Choices that leave in their path "what-if?" And once we choose a path, we can rarely go back to see where the other would have lead. 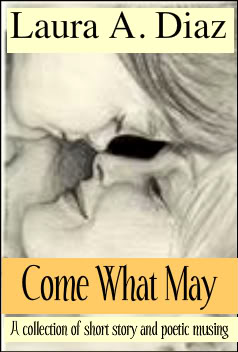 The story "Come What May" is the first in this inspirational and thought- provoking collection. Come What May introduces us to Cayla . As a college student, Cayla met with a crossroad-choice that would haunt her and leave her wondering ‘what-if?' And with 'what-if' dogging your steps like a tired pack mule, does anyone really get a 'what-if-free' happy ending this side of heaven? This is one woman's struggle with ‘what-if,’ and how she has dealt with it. Or has she? This entire collection is full to overflowing with moments that will make you laugh-out-loud and nod your head. It is topped off, like icing on a cake, with a poem that wraps up the whole 'what-if' theme and a concluding chapter that gives you a glimpse of the author's take on this. This is a story that is truly woven, not simply told. As Cayla and Art unravel bit-by-bit, I am drawn to them-- even befriending them. Your word pictures are amazing... and so outside the typical, usual descriptions ("cheetos-orange mug," "bunny-slippered feet," and "ever-unruly curly bob"). There is such an authenticity here as well, with REAL happenings that make me smile, such as: "junk click delete." From the chapter titles like 'Classy Ties and Oodles of Time,' to the refreshing word choice, to the story line itself, this piece oozes with imagination, creativity, and love. This is the kind of story I would truly read from cover to cover... the kind of book I would undoubtedly purchase and put on my personal bookshelf .A lovely piece. Come What May, I think taps into a thought that every single person on the planet has had at one point in their life, “What if I had taken the other path life set out for me?” Our lives are like branches on a tree, and once you choose to move down one, you almost never can go back and see where the other one would have lead. On that count, author Laura A. Diaz has brilliantly found a way to write a book that will appeal to everyone regardless of where they are on the road of life. While that alone makes this book extremely marketable, the style will make readers glad they picked it up. It’s also interesting to make the main character 62-years old. It reminds us that the human animal is not that different from generation to generation. We all question what we’ve done with our lives, and the fantasy that someone in their sixties must be content and living with no regrets is an illusion crafted by people who aren’t likely that old. But Cayla Lysander’s concerns are the concerns of us all. I can’t imagine this book not being successful. Very few titles can legitimately claim such a large potential reading pool. And anyone who picks it up won’t be disappointed. It is rare that something touches me this closely. I cried with Cayla, and laughed with Cayla, and felt the butterflies in my stomach as Cayla remembered everything her and Daniel had and then again as she saw him walking towards her. I was there I saw her and her granddaughter is beautiful. Bless young Kelly, I'm glad she didn't succeed with the cord, but I can see why she thought of that. I hurt for her. I wanted to wrap her in my arms and tell her that it's ok, but GOD did and he is so much better than I would have been. Tears come into my eyes as I write this. I have never before seen a book so very unique, and your talent for storytelling, I am in awe of. By the way-- "It's all good!!!"